Spicy Garlic Shrimp with a generous flavor of lime, served on hot buttered thin spaghetti noodles. Browning the butter gives the noodles a wonderful nutty flavor, once browned, pour over cooked noodles and then sprinkle the noodles with grated Parmesan or Romano cheese. If not sure how to brown butter, click on the link to see how to do it. 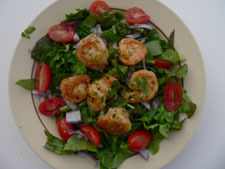 Try serving these delicious shrimp cold as an appetizer or make ahead and use in shrimp salad recipes to make a quick and easy lunch. Press the garlic cloves into the oil and let sit for 1 hour. Put garlic/oil in large sauce pan and preheat over medium heat. Add shrimp. Squeeze juice of one whole fresh lime into pan over shrimp. Sprinkle blend of dry seasonings over shrimp and saute 5 - 8 minutes until shrimp is opaque, being careful not to over cook the shrimp. For a evening meal, serve on a bed buttered noodles. Prepare one of the Easy Salad Recipes and crusty french garlic bread. Easy seafood tacos, add mild cheese, tomato and shredded lettuce. 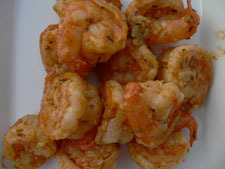 and add these spicy shrimp. Or, serve on a lettuce leaf for an appetizer. Tip: The trick to cooking shrimp firm but not rubbery is to cook till the shrimp turns opaque and the color turns bright pink/orange. In the recipes, with all the spices, it is hard to see this change during the cooking so it is important to watch your time. Shrimp usually cooks in just minutes. Over medium heat, your shrimp will be done in about 8 minutes total.